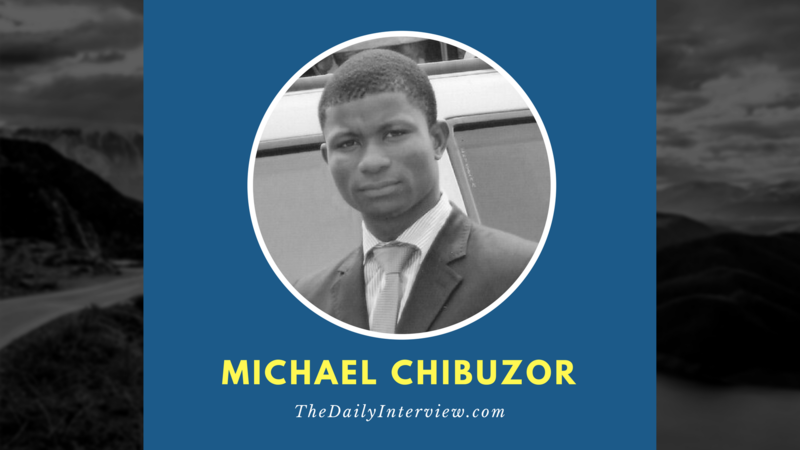 Today’s interview features internet entrepreneur Michael Chibuzor. He’s done a lot as an internet marketer, but is most skilled with copywriting, blogging, and general freelance writing. Even more amazing – he’s done it all as a non-native English speaker! One thing I’ve found with Michael is that really knows how to write a killer headline, and that’s critically important when it comes to any kind of content marketing. Michael, I’m excited to feature you on The Daily Interview to learn more about your journey as well as discuss your blog, Content Marketing Up. You have some amazing posts about content marketing and copy writing and I see you do a tremendous amount of freelance writing and guest blogging. Tell us a bit more about yourself and your business. How did you get started in this industry? What do you spend most of your time on these days? Thank you so much Eric for your concern. I truly appreciate your time. My full name (online) is Michael Chibuzor. I started my first online business in 2007. At the time, I was writing keyword-rich articles and getting them ranked in Google top 10 within 30 days. This method is known as “bum marketing.” I was making a few hundred bucks from affiliate marketing but later on, I decided to change my approach for one reason: I enjoy writing articles. So, in 2011, I officially launched my contentmarketup.com blog and also became a freelance copywriter. These days, I spend most of my time building niche sites, writing detailed and well-researched content for a few high-paying clients and designing websites (I just added this). My greatest success story was in 2012 when my guest posts were featured on industry blogs such as Yahoo! Small Business, Problogger.net and freelanceswitch.com. I thought it was impossible for me to actualize the goal I wrote down for myself – but I did. Also, I made close to $40,000 as a freelance writer and I made this money with zero advertising cost. In other words, I got all my high-paying clients through guest blogging and organic traffic. That’s a great success story, and it sounds like you’ve steadily built up a nice freelance writing business. What’s on the horizon for you? What are your major goals for 2014 and beyond? My major goal in 2014 is to develop a system for my freelance business as well as niche marketing models. I need more time for my family. I need more time offline to handle some projects and I wish to travel more. That is the summary of my goal for 2014 and beyond. I love the way you craft the headlines to your blog posts and really pull the reader in with your introductions. It’s clear that you really know how to write good copy and engaging content. While you definitely have a talent, there are probably some things that other people can learn and apply to their own writing. What are maybe 2-3 tips you can share about writing eye-catching titles/introductions that you see missing from a lot of writers’ articles and blog posts online? It’s simple. You don’t need to reinvent the wheel and strain your veins trying to write catchy headlines. All you have to do is learn from experts whose headlines piqued your interest, and write your own. For instance, if you love any of my headlines, simply study the powerful words I used, analyze the phrase and then create a more powerful headline. When it comes to writing introductions, asking questions works best for me. Sometimes, I arouse curiosity by quoting a strange thing. You can also tell short stories because every one of your readers is a human being with a soul and spirit – stories nourish those entities. All successful people stumble at least a few times along the way. What has been your most significant failure, and what did you learn from it? I’m not immune to failure. In fact, I failed at a certain project at the beginning of 2013. But I’ve learned to always look at the bright/positive side of every circumstance. No matter what I feel has happened it can never be equated to the life-changing lessons. My greatest failure in 2011 when I started blogging was trying to write for everyone. I didn’t know who my target audience was. As a result of this, my blog didn’t generate any significant income because I wasn’t sure of what my readers desperately needed. A quick fix: get to know who needs to read your posts and should read your posts. That’s the first step to blogging success or any or business venture for that matter. Let’s take a step back and look more generally at blogging. I know you have a lot of great advice to share, but If you had to take your best advice and put it into one sentence or phrase, what would that be? If you can successfully do this, you’ll succeed with your blog. Honestly, I found out that using a lot of resources can cause you to become unproductive. Basically, I use Google Analytics to track hits. I use Getresponse autoresponder for my email follow up and newsletter. Then I have Vaultpress for my WordPress backups. Those are the essential resources I use. Other ones are not that useful. For someone who has been blogging on their own websites, but wants to get into freelance writing or (paid) guest blogging, what advice would you offer? What do you wish someone told you about when you first started? First, if you want to get into freelance writing or paid guest blogging, you have to first and foremost define your ideal client. Second, when looking for clients, don’t market your services to the wrong websites/portals. Here is what I mean: if you choose guest blogging as a way to get clients, never submit an article to a blog that talks about writing or something similar. The truth is that no prospect wants to improve their writing skills. What they want is quality traffic and sales. Find blogs where your target audience/ideal client visits often and feature your content there. You’d get better clients and make more money. Thanks for taking the time to do this interview, Michael! What did you think of this interview? Leave a comment below!